Gold brushed bronze blend with a huge lemon yellow throat. Fragrant. This is my plants 2nd year and from the first this plant was amazing!! It is truley beautiful. It almost has to be dead headed to make room for the new flowers, they are so crowded on the plant, you can’t beleive its beauty. It gets alot of ahh’s and oh’s in my garden ,don’t pass this one up you won’t be disappointed it’s lovely to say the least !!! 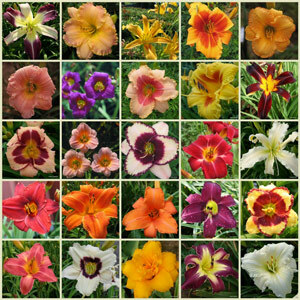 The BEST o over 100 daylilies I have ordered from Oakes!!! or anywhere else! 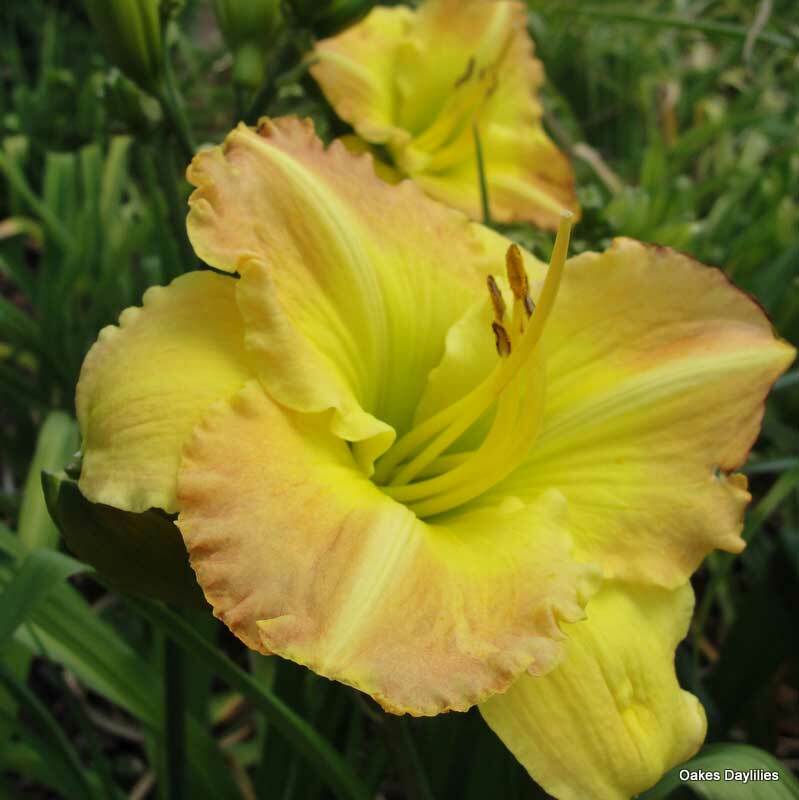 This is a strong scaped, huge flowered, lollapalooza of a daylily -of gorgeous and unusual form! 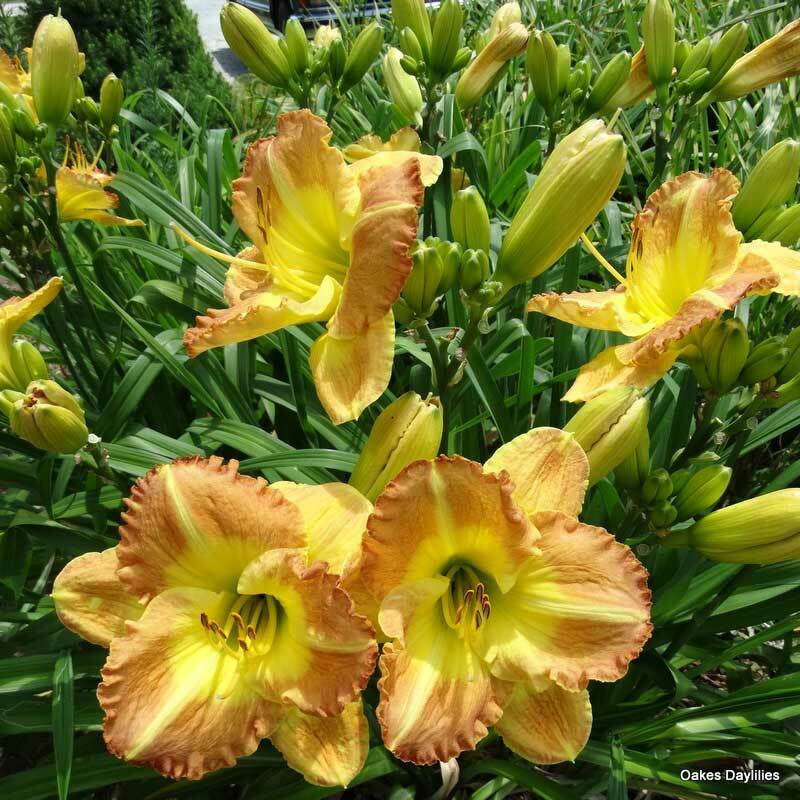 Love the big, fat, almost round buds that sit on top of the stems – sometimes 3 or 4 blooming together on a single stem like a big nosegay – LOVE this daylily! The coloring is like a beautiful watercolor! 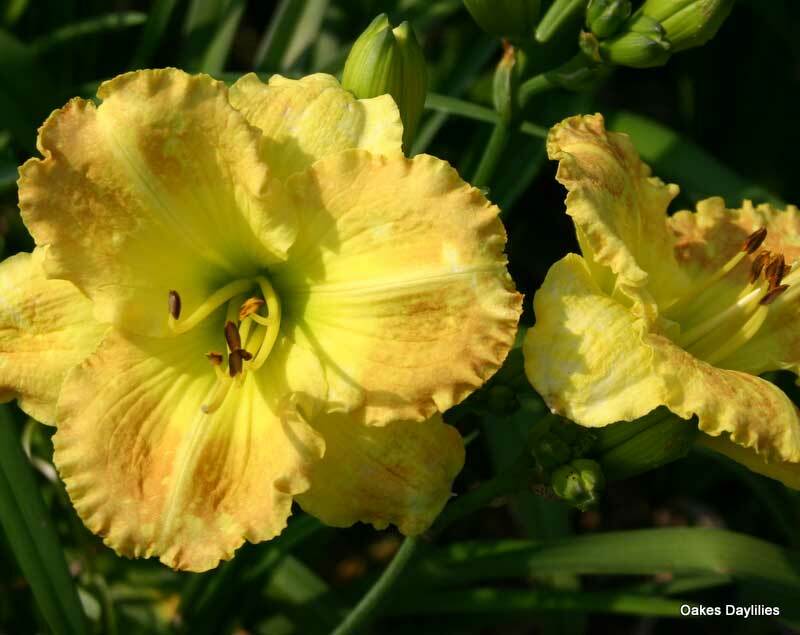 The plant is almost “architectural” – and I think it benefits with a more delicate daylily forms for partners. My three plants share space with plantings of Brown Recluse and Twiggy – very nice group! It sure does grab my attention every morning! Wow!! 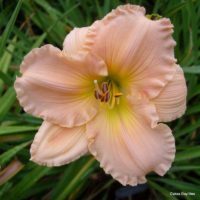 This daylily is beautiful and a showstopper. 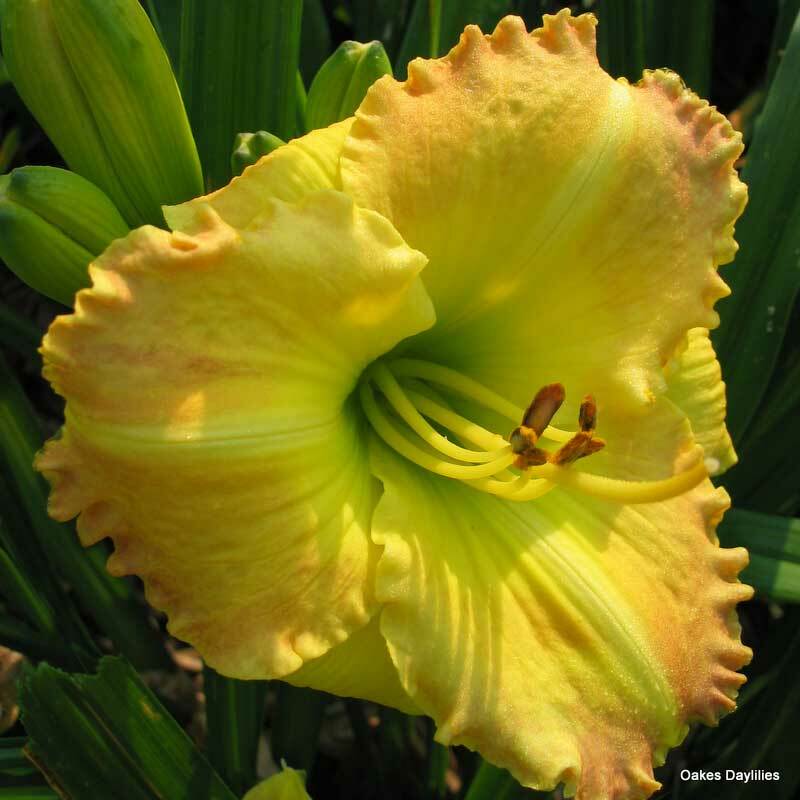 Tall and strong flower stems erupt into this ruffled soft yellow with a tinge of soft pink edging flower that’s truly huge in diameter. This is a must have in your garden – it will not disappoint. What a performer! This huge strong plant is loaded with big fat buds that burst open with grand glorious color. I was a little nervous about the “bronze” in the description being brown or muddy. 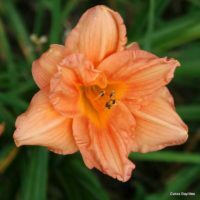 I was thrilled to find that the flower’s accent color resembles a watercolor wash of pinky reddish orange spilled over its brilliant yellow gold! I give this plant an eleven! Absolutely one of my very favorites. My plant was loaded with blooms this year, probably over 50. 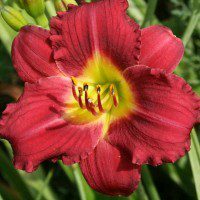 Extremely robust, heavy super-frilly blooms with a great combination of colors. 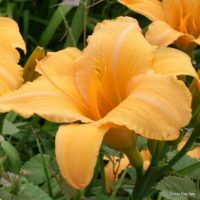 It deserves a place of honor in every daylily garden. 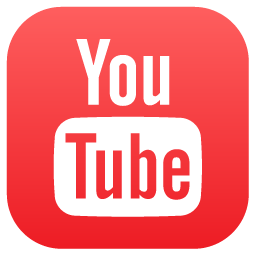 I gave it a 10 – a plant has to be the best of the best for me to rate it that high. I’m very choosy. WOW! double scapes grow fused together. Twice the blooms. First sunlight it is ready for my camera. Noon dappled shade makes this flower dance. Did I say WOW! This single fan was a gift. I had no idea I was so loved.